While most Christmas trees are put up in houses after Thanksgiving, the Battle Corps’ Christmas tree is put up right after Halloween. Students walk throughout the hallway and their eyes catch the Christmas tree, lit with cards instead of ornaments. Each card has a different gift for a kid at the Boys and Girls Club, an after school program in the community. Sydney Livingston, the coordinator and president of Battle Corps, came up with the idea to host a toy drive last year during the holiday season. 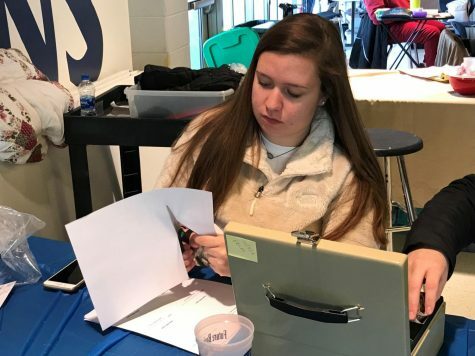 She looked at multiple organizations she could donate the toys to; however, she had a desire to choose the Boys and Girls Club for multiple reasons. The Boys and Girls Club has around 500 students who attend and Battle Corps provided 100 toys last year to students. After getting it approved for the second annual toy drive, Livingston set a goal to collect 200 toys this year. Battle Corp members also helped hang flyers around the hallway and put the information in the daily announcements to spread the word about the toy drive. Another student, Joe Lee, a senior on the baseball team, purchased a baseball and a bat. Lee donated to the toy drive last year. “I hope the kid who receives it will be a student who will make baseball a hobby, and eventually play for the Battle team someday,” Lee said. The gifts on the ranged had a wide variety of options to appeal to the kids at the Boys and Girls Club and also gifts students could donate on their own. The gifts ranged from hats and gloves to an easy bake oven. Livingston hopes that it doesn’t just affect the kids who receives the gift, but also affects the way people in the community think of Battle. To celebrate the toys donated, Battle Corps is delivering the presents on Dec. 14 to the Boys and Girls Club. Santa and snacks will be available.